The Humqadam School Construction and Rehabilitation Programme is helping to build and improve over 1500 classrooms in the two Pakistan provinces of Khyber Pakhtunkhwa and Punjab. The Humqadam School Construction and Rehabilitation Programme is helping to build and improve over 1500 classrooms in the two Pakistan provinces of Khyber Pakhtunkhwa and Punjab. The UK aid sponsored programme is one of a kind school construction programme, defying stereotypes and achieving excellence in rural Pakistan. The programme is changing the mindset over public educational buildings by providing communities with world-class infrastructure that is having a life-changing impact for many. 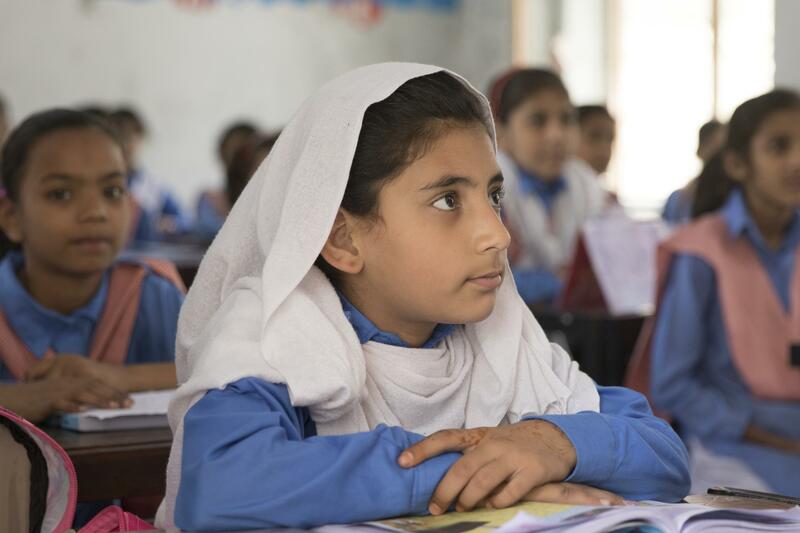 As of January 2019, Humqadam has built 1.586 classrooms and 909 toilets in 103 schools in Pakistan. Government Girls’ High School ‘Glothian Kurd’ has faced severe challenges in accommodating around 1040 girls with only 13 classrooms and 12 toilets. Most of the times classes were held outside in the open, meaning that extreme weather conditions in winter and summer often negatively affected learning activities, impacting on students’ ability to concentrate and teachers’ performance. Now, the school is under refurbishment and will soon be able to accommodate students appropriately. 14 new classrooms are being built using sustainable and durable construction techniques. Other neglected schools like Glothian Kurd have been upgraded thanks to Humqadam. The programme puts the students and community experience at heart, going well beyond stereotypes. These buildings are already having a life-changing impact by providing a safe space for all, including girls and the disabled, and drastically improving the learning environment. What’s more, these schools also involve the community, by actively engaging the local school council members regarding the construction progress, taking in their views and suggestions for the works to carry out. By building more toilets tailored at the needs of female students, the programme is improving school attendance for a large number of girls. Female students were likely to skip school during menstruation because of the lack of proper WASH facilities at school. In addition, accessible buildings ensure that disabled pupils can attend all of the classes safely and comfortably. Advanced and sustainable construction techniques, such as the Rat Trap bond or the Chinese brick bond, provide notable advantages such as improved insulation, and help save about 25% of bricks compared to traditional brick bonds. Now all classes will stay cool during summer and will retain heat indoors in winter time. Reinforced foundations add more stability to the building, making schools more resilient to earthquakes, cyclones and other disasters. All of these features ensure that the buildings being upgraded or rebuilt are inclusive and safe for all, achieving excellence with value for money to deliver world-class infrastructure for the disadvantaged that need it the most. This video explains how the Chinese brick bond works. To learn more about the latest developments on the field, browse Humqadam’s news. Learn more about the project and IMC Worldwide.